Spacious double room waterfall in the main house for max. 3 pers. 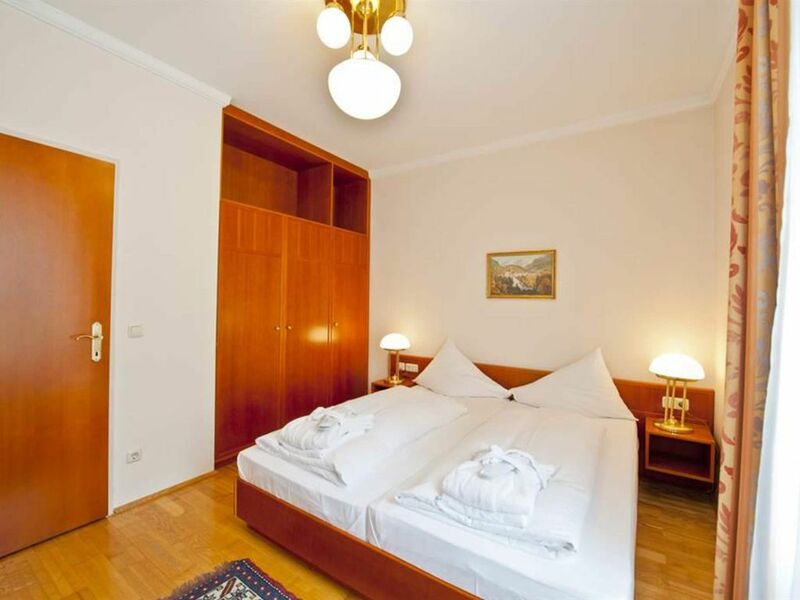 with bath / shower, WC, hair dryer, radio, SAT-TV, safe, free WLAN and minibar. Enjoy the unique view of the Gastein waterfall and the entrance to the hotel's Roman thermal bath. Whether a romantic couple holiday, skiing holiday with the family or a group outing with friends - the Hotel Sanotel in Bad Gastein has the right offer for everyone!Location of the establishmentHotel Sanotel is centrally located in Bad Gastein, directly at the famous waterfall. Here you will find that "central rest position" is not a contradiction, but a true quality feature of the Gastein valley. DescriptionHotel Sanotel offers various rooms with half board: from double rooms to superior and deluxe double rooms to family apartments and suites, everyone will find what they need. 2 minutes walk from the main house is the residence with additional 2 apartments, for 1 to 4 people, without meals. All rooms and apartments are cozy and furnished with great attention to detail, in the apartments you will find a fully equipped kitchenette for convivial evenings with the family and romantic, shared cooking for couples. Comfortable living meets a wide range of wellness and beauty options: At Hotel Sanotel you do not even have to go out for a full-fledged wellness holiday! In the in-house spa area, the "Römertherme" awaits you with its whirlpool, indoor pool with waterfall, saunas and steam baths, a winter garden and a fitness room may not be missing. For a fee, there is the full beauty program with massage center, beauty farm, solarium and other health services. Winter in GasteinDirectly in front of the hotel entrance there is a ski bus stop, where the free ski bus picks you up and brings you directly to the Stubnerkogelbahn - and further into the largest contiguous Gastein ski area: Schlossalm-Angertal-Stubnerkogel. There are nothing left to be desired among winter sports enthusiasts!Summer in GasteinDer Graukogel is known in summer especially for its old Swiss stone pine, with trees that are up to 300 years old. You can explore this stock during a beautiful hike that is good not only for the nose, but also for the heart: From the top station of the Graukogelbahn cable car, a 45-minute walk takes you through this idyllic place, where you can also test the large outdoor pine bed can!Welcome to the Hotel Sanotel in Bad Gastein!